Happy Hamby Campers: Sharp thinking! We do a lot of picnics, so our picnic kit is well equipped. 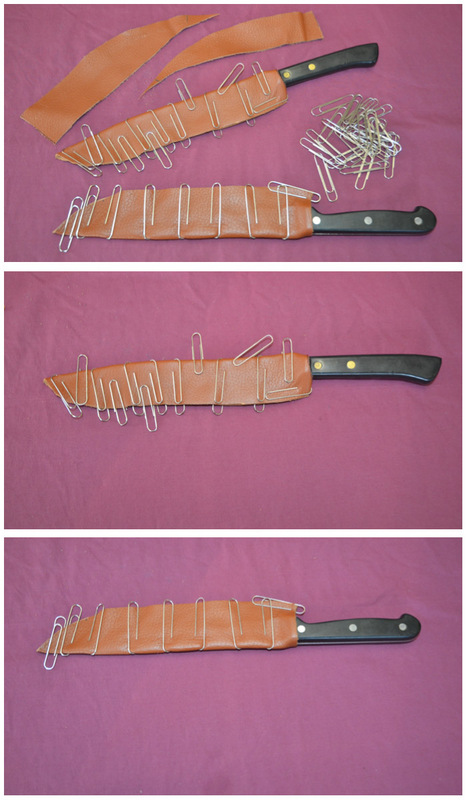 We usually carry two sharp knives - one for bread and the other for anything else! 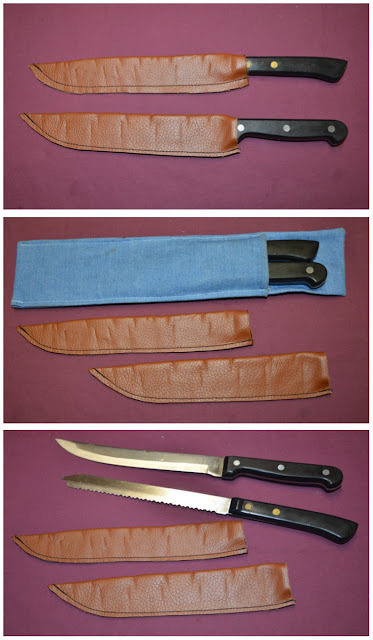 A while back I made a denim sheath for our bread knife and it's non-serrated companion. That effort (shown in the bottom collage pic) wasn't an ideal solution, so I've been thinking of a better storage method. The denim cover will still be used, when carrying dirty knives home for washing. During the week we visited Reverse Garbage and bought some thin leather pieces, which were priced at $17/kg. I only paid a few dollars for my choices. Nick helped cut two shaped pieces, one for each knife. They fold along the top edge of the blades. 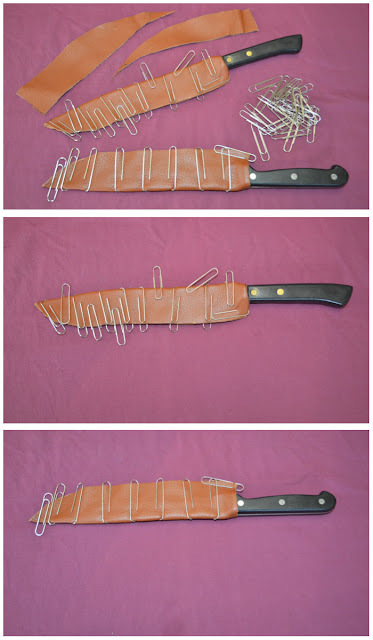 Both pieces were wet and then folded in place around the knives, secured by paper clips. About 24 hours later, those large paper clips were removed. I then used my sewing machine to sew along the curved edge of each sheath. I worked very slowly and carefully, using a longer stitch. I sewed two rows of stitching, one directly over the other, for extra strength and security. After checking both knives fit into their new covers, I trimmed away some excess leather. I'm quite pleased with the result - cos I wasn't sure my machine would sew through two layers of leather. Hooray!